« Treasure hunt 4 kids » proposes some treasure hunts for kids or Police investigations for kids games, ready-to-print and play. Throw a birthday party they'll never forget! We offer you, parents, a wide choice of treasure hunt for kids and police investigation for kids, and other kinds of kid friendly surveys. Furthermore they are all ready to play and education-oriented. They help you to easily organize birthday parties for your children, from 4 to 12 years. Our games are intended for every occasion, whether it is a birthday or a family gathering. 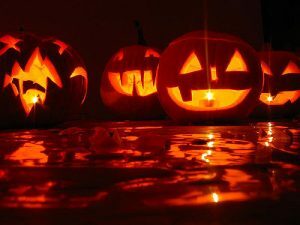 As well as get-together for your children and their friends or simply to celebrate any special events (Halloween, Christmas, carnivals…). 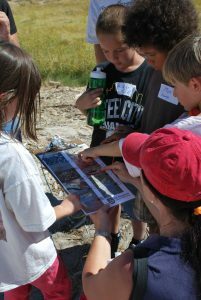 Treasure hunts for kids will give them something fun to do, and are a great way for you to get more involved with your kids and learn about their interest. We have as much fun planning our treasure hunts together as we do actually completing them. Treasure hunts are fun, interactive and creative and we tailor them for kids from 4 to 12 years old.. You can have a treasure hunt right at home, in your yard or just about anywhere. And the different themes and styles to choose from are endless. 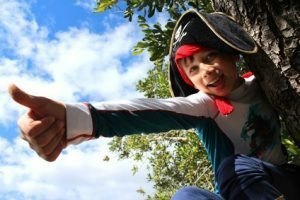 Because there's an adventurer in every child, treasure hunt for kids have always been a success! It's the perfect occasion for your children and their friends to get together and share an adventure you'll set up for them, using our gaming kits, all ready to play. Moreover, treasure hunts are inexpensive! However they require planning and organization. Our kits are here to help you achieving a well-balanced and successful game, while saving you time and hassles. They provide step by step instructions, explaining all the important elements to ensure your treasure hunt is a success. Furthermore, you get tools to plan and arrange for kids to stay over, their lunches and breaks times, and more... Finally, whether it's at home or in public places, you can always keep track of the hunting time, thanks to our kits. Puzzles should be suitable for the age of the kids: neither too easy, nor too complicated. Finding the right balance is one of the most difficult things when setting up a treasure hunt. Theme: you should choose a theme your children and their friends will love! Location: a house, garden, shopping center, park or forest, there are so many places where you can organize treasure hunts. Remember that the location will impact the riddles, as they indicate where the next clue is hidden. Our games are especially designed by early childhood professionals to help with every step of the preparation. There's a treasure hunt for every kid! 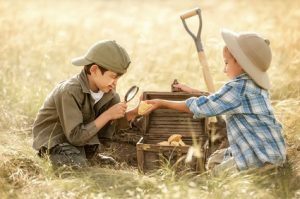 Above all, the most important is that your children will have a party they'll always remember, and whilst it's all about fun, treasure hunts for kids are educational as well. Still, you can always set up a scavenger hunt based on your kids centers of interest! (western, super heroes, exploration, investigation...). And for that we offer a wide range of themes, for outdoor or indoor activity, you pick what you want and what will make your children happy! Come in and discover our games, all ready-to-print and ready to play.